Rock Hills has quietly put together a top-5 year with an 8-1 record. The Grizzlies have averaged 257 rushing yards a contest. Junior Dereck Gillett has completed 43 of 71 passes for 722 yards with a 14/2 TD/INT ratio. Junior Zane Colson has been one of eight-man’s most explosive backs with 124 carries for 1,313 yards and 22 scores. He also has 10 catches for 165 yards and two TDs. Sophomore Rylee Whelchel has 17 carries for 442 yards and 11 scores. Rock Hills has eight turnovers and stands at plus-16 in turnover margin. Colson, senior Chevy Mohler and senior Tycen Higer rank 1-2-3 in tackles and have combined for 43 TFLs. Rock Hills’ only loss came in overtime to No. 2 Pike Valley, 28-22 in overtime, in Week 6, a game that concluded Monday because of weather. The other eight wins have come by 45 points. Hanover, which cruised to the Division II championship last season, has again rolled through the regular season. The Wildcats has outscored opponents 492-32. Hanover is tied for second in scoring offense and first in scoring defense. Rock Hills has a total margin of 482-96 and ranks fourth in scoring offense and third in scoring defense. Hanover has won every game by at least 40 points. Hanover junior quarterback Daiken Stallbaumer has completed 17 of 28 passes for 410 yards with seven touchdowns against no interceptions. Senior Kevin Diederich has 38 carries for 654 yards and 16 rushing yards. Senior Carlos Emanuel, a Division I prospect, has 45 tackles with a team-high 11.5 TFLs. Hanover has forced 21 turnovers. Last year, Hanover had easily its toughest playoff game in the first round, a 38-12 win against Beloit/St. John’s-Tipton. BSJT was the District 4 runner-up behind Pike Valley. Rock Hills is the District 4 runner-up behind Pike Valley this season. The Grizzlies push Hanover, but the Wildcats earn the victory. Both of these Division II teams didn’t make the playoffs last season. Northern Valley has had multiple solid teams but is back in the playoffs for the first time since 2005. Hodgeman County returns following a one-season absence. Northern Valley lost to Dighton, 36-20, in Week 4, and Hodgeman County defeated the Hornets, 46-6, in Week 8. However, Northern Valley has significantly improved, especially defensively, since changing to a 3-2 look after Week 2. The Huskies have won five straight since the Dighton loss and allowed just 26 total points. Much of this game hinges on Hodgeman County’s health. The Longhorns has lost junior Luke Shiew, the team’s leading tackler in ‘16, after Week 1 to a season-ending neck injury. Senior quarterback Jacob Salmans is a four-year starter and has been hobbled since Week 4 with a bad foot injury. 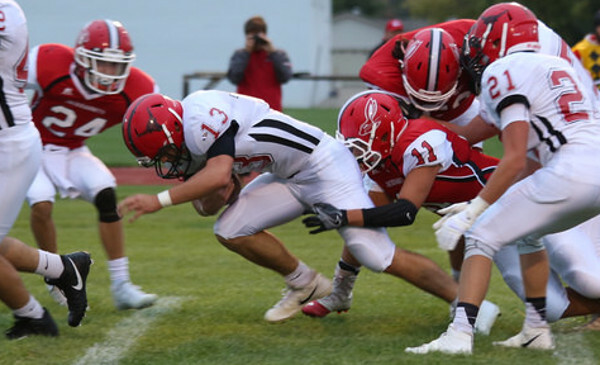 Coach Matt Housman said if eight-man had kept its past schedule of playing Week 9 on Thursday and then the first round of the playoffs the following Tuesday, Salmans would possibly not have played Week 9, a loss to Otis-Bison. Housman listed Salmans at about 65 to 70 percent after the Otis-Bison defeat with his scrambling ability very diminished. Additionally, sophomore Eli Salmans has rolled both ankles. Jacob and freshman Isaac Salmans have combined for 57 of 100 passing for 1,061 yards with a 12/3 TD/INT ratio. Eli has 141 carries for 939 yards with 16 TDs. Hodgeman County has averaged 7.5 yards per play. The Longhorns have a total margin of 405-177 with the No. 10 SOS in the classification. Northern Valley has a total margin of 422-174 against the No. 36 SOS. Northern Valley senior Caden Kinderknecht is one of the most statistically productive players in the Chuck Fessenden era that stretches more than 40 years. Kinderknecht has completed 36 of 76 passes for 532 yards with a 9/5 TD/INT ratio. He has 159 carries for 1,392 yards with 22 rushing TDs. Junior Nick Stutsman has 114 carries for 858 yards and 15 scores. Kinderknecht leads with 109 tackles. The Huskies are plus-9 in turnover margin and average 7.2 yards per play. Hodgeman County entered this season as the Division II west favorite. However, Northern Valley has played very well, and the Longhorns, with the injuries, have struggled some against the run. The Huskies earn the playoff win in a high-scoring game.